I ran across an article on Brokelyn.com last week. 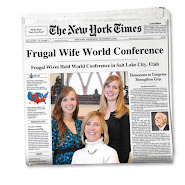 It was about cooking cheaply with a crock pot -- you can find the full article here. Basically the article just talks about this guy that started using his crock pot to make one big meal that would last him a week. His crock pot creations started out pretty bad, but he soon discovered quite a few great recipes that he could make very inexpensively and that would last all week. His food savings were huge because he was only making one meal a week, but also his time savings were pretty big. And as we all know, time is money. This got me thinking about cooking using the crock pot. I love the idea of spending $15 a week on food -- we certainly spend more than that -- but I don't love the idea of eating the same thing every day for lunch and dinner for seven days straight. So I'd like to think of this in the sense that time is money, so we're saving money by saving time. If you've ever cooked with a crock pot, you know how easy it is. It's my favorite Sunday meal because I can throw everything in before we leave for church, and then come home to a delicious smelling house and have dinner on the table in less than ten minutes. But really this is pretty much the extent of my crock pot use. Then, a few months ago, I ran across a recipe that was for dessert made in the crock pot, and this opened up an entire new world of adventurous cooking. I realized I could use this great tool to make more than just a Sunday dinner roast. I could make soup, pasta dishes, rice dishes, fondue, caramel dip, cake, and a million other categories of food. Oh, the things I've been missing out on, like all these amazing sounding desserts! Who knew you could use a crock pot to make all of those? Think of all the time you could save by making a four course meal all in the crock pot (that is, if you had four crock pots...). So, are you crock pot users? Are you adventurous and make a wide variety of food in the crock pot? Or, like me, do you mostly just use it for roasts? Do tell...and share your recipes if you're so inclined. I love my crock pot! I haven't used it much this summer, but during the winter I use it all the time to make soups and chicken dishes. I've tried several recipes from this blog: http://crockpot365.blogspot.com/. I love my crockpot but I definitely sometimes wish I had four of them to use all at the same time! Some of my favorite things to cook in them is apricot chicken, bbq chicken and veggies, a beef and cornbread casserole, and sometimes a roast but not often. I actually like cooking my taco meat in the crockpot. I put a roast in, add some taco seasoning and salsa over the top and let it cook. Then when it's done I shred it and now have taco meat! I also like the 101 things and 101 more things to make with a crockpot by Janet Eyring and Stephanie Ashcroft. I've never tried dessert. We mostly make chicken dishes since we aren't big roast people. But a good tip my friend once told me is that she prefers to use her crock pot in the summer because she doesn't have to heat up her house and spend more on A/C bills like would happen with the oven or even stovetop. She just puts the crock pot out in her garage or on her patio! Cooking with my slow cooker is my favorite way to cook (because I don't like to cook and it's easy)! 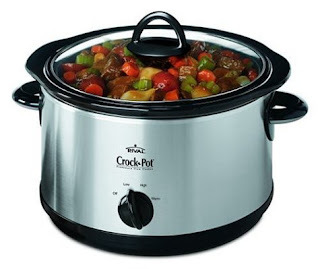 After my summer cooking hiatus I plan on resuming cooking with the crockpot. I have several easy chicken dishes that I make. Like the other Mary, I also like to make taco meat in the crock pot with shredded roast rather than ground beef. My very favorite way to use the crockpot in fall and winter is for making soups and stews! The dinner that I most often make in the crockpot is also the easiest and one that the kids love. Just throw chicken or boneless pork and your choice of barbecue sauce in (I sometimes add honey too) and let it cook all day. Then you just serve it with baked potatoes and sour cream, and veggies. Dinner can't get easier than that! What would I do without a crock pot? THis morning, in fact, I plan on putting in chicken enchiladas (which will be my second crock pot meal this week. I love using it in the summer because it means I don't have to turn my oven on. I like the idea of having to cook once to eat for a week like that guy, but I couldn't eat the same thing for a week either and also I think that the food would go bad after a few days. Anyway, we've kind of done this. I'm sure a lot of people have done this, but I put about 6 frozen chicken breasts into the Crockpot, and then cover with a medium sized jar of Pace Thick and Chunky salsa. I've also added a little chicken broth and some spices like cumin and chili powder, but it's not necessary. Cook on high for 4-5 hours, or on low for 6-8 hours. Then shred or chop the chicken up once it's cooked and return back to the juices in the Crockpot. Then serve. We ate this for 4 meals by changing up how we ate it. The first day it was in burritos, the next day quesadillas, then salad with a creamy cilantro dressing, and then when we were down to the last of the meat, I added a box of chicken broth, a can of diced tomatoes, a can of corn and we topped it with cheese and crushed tortilla chips for a tortilla soup. You can also divide into freezer bags after it's been cooked and shredded/chopped and cooled. It's great to have on hand and just pull it out of the freezer and heat it up in the microwave. I love my crock pot! So easy to use and time efficient too. And I like that it doesn't heat up the kitchen in the summer. I've cooked a whole chicken in there, served it for dinner like that, then used leftovers as pulled chicken sandwiches, on salads, chicken and gravy, etc. I also put the bones back in, added water and a few veggies and made broth. Yum! Fix-it and Forget-it has a good slow cooker cookbook that I just borrowed from the library this week. So many great ideas for a variety of dishes. I fell in love with my crock pot last year when i started my masters and had to leave my hubby to feed our family. We have tried many things but our faves are shredded NC pork bbq, bbq ribs, chilli, roast chicken and beef stew. I don't use my Crockpot nearly as much as I should. If I was more organized and did use it, we wouldn't have to eat out as much. Anyway, I was going to direct you to A Year of Slow Cooking (http://crockpot365.blogspot.com), but a few "commenters" already did.